It was as clear as crystal from the very beginning that the evening was to be wondrous and joyous. A bonanza of young and eager Masons were milling around the lounge bar in the Masonic hall in Blackpool, anticipating the start of the installation meeting of Blackpool Lodge of Fellowship No 7692 in which ‘light blue’ Mason Neil Holt would be installed into the chair of King Solomon by his good friend James (Jim) Coupe, also a ‘light blue’ Mason. 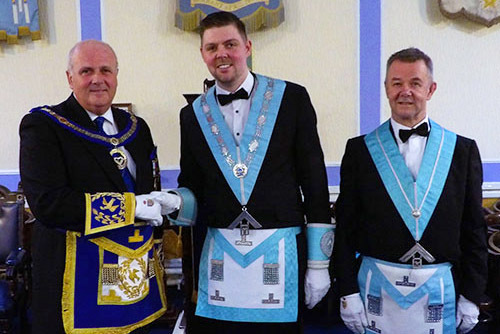 David Winder (left) congratulating new master of the lodge Neil Holt, along with installing master Jim Coupe. Presiding as principal guest at the installation was the ever-youthful Assistant Provincial Grand Master David Winder; in his element as he mingled and chatted with the horde of novice Masons. Offering words of encouragement and doing their best to settle frayed nerves, David and his fellow grand officers, Blackpool Group Chairman John Turpin and Rev Canon Godfrey Hirst, cheerfully wandered from young Mason to young Mason, aware that each was apprehensive about their individual roles in the ensuing ceremony. For some of the rookie Masons, the evening was to be their debut to performing ritual, an ordeal that tests even the most poised and extrovert greenhorn. Indeed, the evening was to be dominated by ‘light blue’ brethren and the outcome proved a most delightful and gratifying occasion. Jim Coupe had confided in David that he had the jitters about the task facing him. “I would rather play the piano in front of 1,000 people in the Albert Hall than stand up and perform an installation ceremony”, was the sentiment he expressed. 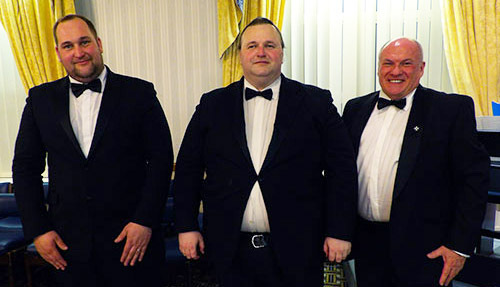 An accomplished pianist and organist, Jim is an unassuming and modest young Mason and during his tenure as master of Blackpool Lodge of Fellowship, has served as a model ambassador for the lodge and Freemasonry in general. Whilst nerves had been steadied during the chit-chats in the bar, there was a resurrection of the jitters when the formalities began – the procession of dignitaries, with acting Provincial grand officers; Joe Codling, Jim Finnegan, Philip Houldsworth, David Kenworthy and David Pallister as its vanguard, presented an intimidating test to even the hardiest of campaigners. David Winder however continued to settle nerves, joking at Jim’s oversight in not offering the gavel of the lodge to him. The ‘light blue’ Masons who presented the working tools. Pictured from left to right, are: Callum Woods, Damian Kendrick and Alan Taylor. No doubt Jim craved a gin and tonic to steady his nerves – not a large one – a bath-tub full would probably have been sufficient. Once he got going, however, Jim conducted the ceremony with sincerity and authority and placed Neil in the chair of King Solomon in splendid fashion. Neil, on his part, appeared confident and relaxed from the moment he approached the master’s pedestal, reciting his obligation as master elect with zest and power. On being placed in the chair, he appeared entirely at ease and was obviously enjoying every moment of the ceremony. Speaking with clarity and firmness, he invested the immediate past master and settled back to savour the remainder of the programme. All was well with Neil and he was lapping it up. As stated earlier in this chronicle, the ‘light blue’ Masons led the proceedings and made the occasion very special. David Winder commented on the number of young Masons present when conveying greetings from the Provincial Grand Master Tony Harrison, saying that Tony would have been delighted to have seen a room so well represented by newer members. Rarely these days do we find that all the major officers in a lodge are ‘light blue’ Masons. This however is the case in Blackpool Lodge of Fellowship and it was a particular delight that the working tools of each degree were presented by ‘junior’ brethren. With it being their debut in ritual, to say that they approached their imminent ordeals leaving them feeling completely at ease would be to present the facts erroneously. Their diffidence was clearly evident but each stiffened the fibres and performed with impressive dignity and passion. David Winder (third left front) and John Turpin (left) along with a group of the ‘light blue’ Masons at the installation. First on the floor with the working tools of a master Mason was Alan Taylor who commenced the piece, diffidently at first but with grit and determination, completing it in fine and powerful manner. In similar vein, Damian Kendrick and Callum Woods presented the second and first degree working tools respectively. With gradually increasing confidence their performances shone with vibrancy and authority. All three performances were a delight to witness and were greatly admired by the gathered cognoscenti. During the investiture of officers, the responsibility of delivering some of the addresses was squarely on the shoulders of a number of ‘dark blue’ Provincial Masons. The installing senior warden Roger Kelly, installing junior warden David Cook and installing inner guard Mike Yeo demonstrated their expertise in ritual. Acting Provincial Grand Steward Joe Codling and Provincial Assistant Grand Director of Ceremonies Philip Houldsworth were also put to the test with addresses to the stewards and assistant secretary respectively. Even grand officers were recruited to trial their skills. Group chairman John Turpin advised the charity steward of his duties and of course, David Winder gave an impassioned address to the brethren of the lodge. Presenting the MCF 2021 Festival Vice Patronage certificate. Pictured left to right, are: John Turpin, David Winder, Neil Holt and Jim Coupe. But it was the younger Masons who stole the show. Jim Coupe had conducted a superb ceremony under the guidance of the lodge’s director of ceremonies Carl Gittins and as a brilliant finale, assistant director of ceremonies Wayne Beacher performed a masterpiece of ritual when he addressed the newly-installed master. His manner when reciting the piece was easy and confident, as if he were just chatting to a few close friends, seemingly oblivious to a room full of discerning critics. The light blues had demonstrated that the future is very bright at Blackpool Lodge of Fellowship. Mention must be made however of one particular dark blue Mason who contributed so much to the proceedings. Past Provincial Junior Grand Warden Philip Bolton, guest organist for the lodge, performed a selection of refrains that not only created a wonderful ambience in the lodge but also introduced light-hearted moments by his choice of appropriate tunes for the investiture of each lodge officer. The day would not have been the same without him. That David Winder had thoroughly enjoyed the ceremony was made evident when he conveyed the greetings of the Provincial Grand Master. David was clearly delighted by what he had just witnessed. A warm smile of appreciation covered the full area of his face, and not only did he thank all those who had participated, he made a point of passing around the lodge to add his personal congratulations to each and every brother who had contributed to its success. There was further cause for celebration when the lodge’s charitable disbursements were announced. 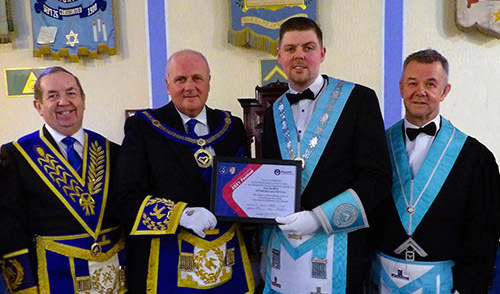 A total of £1,836 was donated to the Masonic Charitable Foundation 2021 Festival, earning the lodge a Vice Patronage of the Festival and as part of the celebration, David presented Neil with a certificate in recognition of the achievement, a particular pleasure for David as Vice President of the Festival. In addition, £1,500 was granted to Rosemere Cancer, £236 to Trinity Hospice, £100 to the Masonic Hall Building Fund, £100 to the Blackpool Masonic Museum, £20 to the Masonic Bowling Society, £25 to the Masonic Fishing Charity and £15 to each of the Masonic Clay Pigeon Shooting and Golfing Societies; a grand total of £3,847. Awarding the ‘Crowd Jewel’. Pictured from left to right, are; David Winder, Anthony Ellis, Carl Gittins and Neil Holt. On completion of the lodge meeting, the throng retired to the comforts of the lounge bar to wrestle with a few restoratives before repairing to the banqueting suite where, with tremendous enthusiasm, they stuffed themselves to the eyebrows. Well, after all, doing a great job gives one a really healthy appetite! The celebrations of the day continued with youthful vivacity; the ‘light blue’ brethren again leading the way. David Winder in his response to the toast to grand officers remarked on the influence that the high number of junior brethren had had on the proceedings. With over 21 light blues present and 10 visiting masters of other lodges (including David who is presently master of Lodge of Peace and Unity No 314) the day had been particularly refreshing and symptomatic of the manner in which the fraternity of Freemasonry is moving forwards. David also commented on the number of Masons wearing what he termed ‘the team colours’, that of the Provincial Festival Tie and the Masonic Charitable Foundation 2021 Festival Jewel and the pride with which they are displayed, adding that Grand Lodge is encouraging more openness in proclaiming our interests in and the benefits of Freemasonry in the community. Multi-talented immediate past master Jim Coupe was called upon to propose the toast to the new master and having done so with warmth and geniality, had to immediately retire from his seat and rush to the piano in order to accompany Harry Waggett in the traditional master’s song. Harry, on his part, performed with the relaxed and easy manner with which he has become associated. The evening had been a delight. The light blue brethren had ensured that it was vibrant, youthful and full of punch. 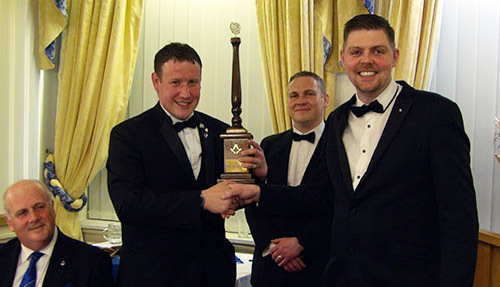 The meeting had attracted a multitude of young Masons from a number of other lodges; perhaps with the aim of securing the much coveted ‘Crowd Jewel’, a trophy presented to the lodge that assembles the largest number of its members as visitors. Proudly receiving the award from the Blackpool Lodge of Fellowship was Anthony Ellis, master of the Blackpool Lodge of Tranquillity No 6544. Time will tell if Blackpool Lodge of Fellowship can regain the trophy at the next meeting of Blackpool Lodge of Tranquillity Lodge. Its members have certainly got the enthusiasm and spirit to put on a good show and the energy and determination to continue to be winners. Pictured from left to right, are; Jim Finnegan, Philip Houldsworth, John Turpin, David Winder, Neil Holt, Jim Coupe, David Kenworthy, Godfrey Hirst, David Pallister, David Cook and Joe Codling.